Come Out – Dig In! Did you know that southeast Vancouver is home to one of the largest parks in the City? Everett Crowley Park is an urban forest. From the views of Richmond farmlands to the tranquil Avalon Pond, there are many trails and quiet places to enjoy choruses of birds and a lush woodland feel. The site is named for Park Board Commissioner Everett Crowley, longtime resident and owner of Avalon, Vancouver's last independent dairy. Formerly known as the Kerr Road Dump, this area was a closed landfill for 25 years before its official opening as a park in 1987. Through the hard work and dedication of community stewards and the Parks Board, the natural environment is recovering resulting in a lovely wooded and hilly habitat frequented by birds and other urban wildlife. A great place for dog walking too! In 2017 the Vancouver Parks Board piloted a park stewardship program in Everett Crowley Park. 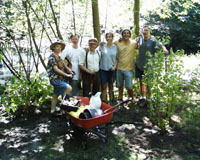 Individuals, couples, and families enthusiastically volunteered to help keep “invasives” at bay in newly replanted areas of the park. The Park Stewardship program is now growing strong, with monthly “invasive pull” events. Working together is a fun and efficient way to get things done! The scene at Earth Day 2018 at Everett Crowley Park - with native shrubs ready for planting. Photo by Mary Hiebert. Everett Crowley Park is a perfect place for nature-based learning. School and out-of-school groups are invited to come and learn. A scheduled school class arrives at nearby Champlain Heights Community Centre where the first lesson is: History. Looking up at the giant jigsaw puzzle mural in the Centre’s entrance way, the children learn how long humans have lived in this area, who the first peoples were and how they lived. The story unfolds, first nations, then colonization, logging of the area, then dairy farming, City landfill, and finally what is now Everett Crowley Park. Then it’s off to the park itself for hands-on tree planting by the children, mushroom log inoculation, sound scaping and listening. A very healthy way to learn. 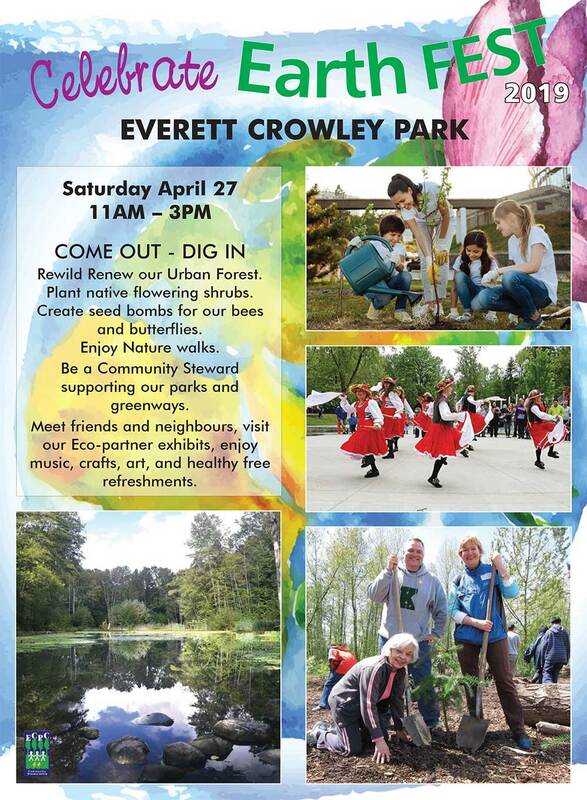 If you haven’t visited Everett Crowley Park for a while, come out to Earth Fest celebration on Saturday April 27. There will be a wide range of free family-friendly activities including music and dance by the Tiddley Cove Morris Dancers, eco-demonstrations such as mason bee care and health, Dogs in the Park Initiative, nature talks and walks, forest-based learning, stream keeping Vancouver’s streams and rivers, hands on making of spore and seed “bombs”. Join volunteers to plant bee-friendly shrubs and tree-friendly mushrooms. Learn the past history of the Park and where it’s growing, what Park Stewards are doing and how you can be involved. The entertainment, exhibits, and activities are all free and wheelchair accessible. Free healthy snacks and refreshments – please bring your own cup! This annual community event is organized by local residents and is supported by the Champlain Heights Community Association’s Everett Crowley Park Committee in partnership with the Vancouver Parks Board. April 27, 11 am – 3 pm. From the 7200 Kerr Street parking lot, follow the signs to the Earth Fest celebration site. 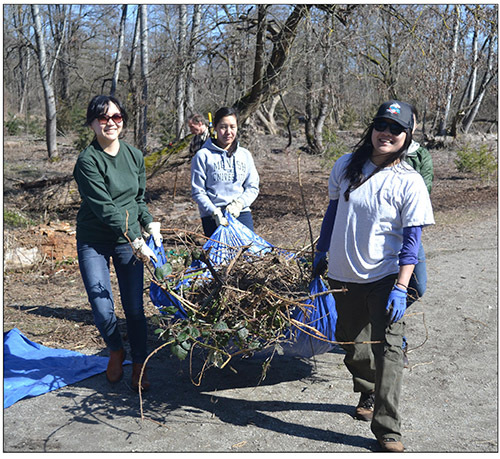 Park steward Kimberly San (right) leads the removal of invasive Himalayan blackbery to help "rewild" Everett Crowly Park at a recent monthly invasives pull day. Photo by David Hiebert. Signed permission of use given. Everett Crowley Park, a 40 hectare (100 acre) parcel of land in southeast Vancouver, is a unique place for recreation, nature appreciation, and wildlife habitat in the city. Located near Kerr Rd. and Marine Way, the park rests on an escarpment and looks out over the North arm of the Fraser River. Nature trails and walking paths offer magnificent views of farms and fields in Richmond, and on a clear day the Gulf Islands and Mount Baker are visible. This is a now beautiful area of the city that has evolved amidst both the disturbances and positive influences of human activity in a large city. In fact, Everett Crowley Park is Vancouver's 5th largest park, but was Vancouver's main landfill (the Kerr Road dump) from 1944 to 1967. ALERT! This park needs your help as it faces two new challenges. First, the City of Vancouver will soon launch a long-term management planning process for the park. Click here to learn more about this exciting project, which is something we have been seeking for many years. Secondly, the future of the East Fraserlands area directly south of the park is under discussion right now. Click here to read about the risks and opportunities re: this rezoning application.